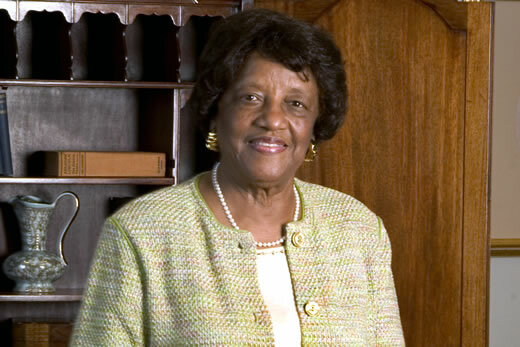 A national nursing icon and Georgia nursing leader, Verdelle Bellamy died on April 22. She was 88. Bellamy was known as a pioneer in the nursing profession. She was one of the first two African American students to graduate from Emory University in 1963, where she earned a master's degree in nursing from the Nell Hodgson Woodruff School of Nursing. Bellamy was a nationally-recognized nursing leader in veteran health care. In addition to integrating Emory University, she was also the first African American administrator at the Atlanta VA Medical Center (VAMC) when she became the associate chief of nursing for geriatric services. She eventually rose through the ranks at the VAMC to become chief of long-term care nursing. Bellamy's leadership led to major improvements in patient care, including the design and implementation of the state-of-the-art VA Nursing Home, where she worked tirelessly until her retirement in 1998. Bellamy played an instrumental role in advance veteran-centric nursing care nationwide by serving in leadership positions for the Nurses Organization of Veteran Affairs (NOVA), which is the largest organization dedicated to shaping nursing care within the Department of Veterans Affairs. Bellamy served as a board member, secretary, and vice president for this important organization. In 1974, Bellamy became the first African American person to receive a gubernatorial appointment to the Georgia Board of Nursing from then-governor Jimmy Carter. In 1980, Bellamy was honored in the U.S. House of Representatives. In 1981, she received the Alumni Merit Award from Tuskegee University. In 1993, she was inducted into the American Academy of Nursing, the most prestigious honor for nursing professionals. In 2005, she earned Emory's highest alumni honor—the Emory Medal. She was also recognized as an Emory University History Maker during Emory's 175th Anniversary in 2011. "Verdelle Bellamy's passing is a great loss for Emory's nursing community," said Linda McCauley, dean and professor of the Nell Hodgson Woodruff School of Nursing. "She was a visionary leader and a change agent for patient-centered care for veterans. She is one of the most influential alumnae to ever graduate from Emory University by becoming its first African American graduate. Countless Emory nursing students and VA patients have, and will continue to be touched by the legacy Verdelle has set forth." Verdelle was born on March 15, 1927 in Birmingham, Alabama. She earned a bachelor's degree from Tuskegee University and a master's degree in nursing from Emory University. At a service honoring Bellamy held May 1 at Christian Fellowship Baptist Church, Gary Hauk, vice president and deputy to the president at Emory, discussed Bellamy’s role in integrating Emory and the lack of controversy compared to some other Southern universities. Angela Amar, assistant dean for BSN education at the School of Nursing, praised Bellamy for helping pave the way for other students and future nurses. In lieu of flowers, the family requests that donations be made to Emory's Nell Hodgson Woodruff School of Nursing in loving memory of Verdelle Bellamy, 1520 Clifton Road, NE, Suite 442, Atlanta, GA 30322-4207.